RYANAIR AVIATIONS MOST EXPLOITED AIRLINE WORKFORCE .We are in no way affiliated with Ryanair. : Twitter has now put Anti Ryanair Blog 4th on their search engines ...WOW. 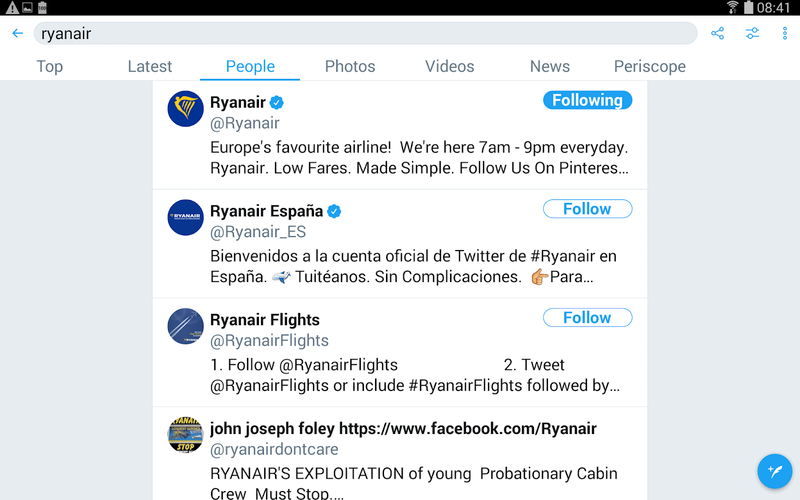 Twitter has now put Anti Ryanair Blog 4th on their search engines ...WOW. 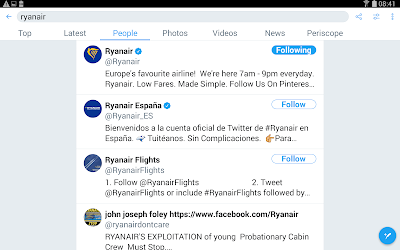 Twitter has now put Anti Ryanair Blog Ryanairdontcare Campaign 4th on their search engine. This is great news for the real truth to be exposed about "How Bag Ryanair Really are"... Time for us all to Boycott this airline. John said, It is time now for the public to act. I realized Ryan Air was a horrible company the first time I flew with them: sadly I had a return ticket wit them. My firm opinion on this has little to do with the industry they are in but their conduct in general to their customers and apparently own staff. This then tells me it would be logical to realize would come from the top. It's how the top management wish to run what is truly an ugly, greedy, self-centered organisation far more insidiously interested in profit above everything else however they may be forced to squirm through mandatory regulations. I write all this following my fourth and last flight I had with them; regrettably as it had been 16 years since the first set of return flights after which I long forgotten to inform a friend who booked us together to fly to Italy. Well low and behold, the online check-in was so unnecessarily tedious I realized it could only be by intention. And by statistics of my own experience, the service is late all the time (100% record), however it was my last flight which entitled me by way of EU regulations to a refund. It was this process which was made so inconceivably and unbelievably complicated that there is no doubt that it yet just another genuine expression of greed from the top. All round disgusting. I don't care if these board room greedy guts were running a grocery chain or a microchip factory, their disgusting behavior is sick. The last place this should be tolerated, never mind trusted is within an airline company.